For the second straight year, the Nebraska football team’s Red-White Spring Game will feature a capacity crowd. The school announced Saturday afternoon that it sold out Memorial Stadium for the April 13th scrimmage. Tickets first went on sale Tuesday for season ticket holders and Wednesday for the general public, and by late Wednesday night, more than 80,000 tickets had been sold. The 2018 crowd set a Red-White spring game record at 86,818. 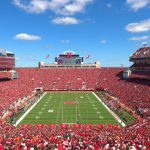 Nebraska has drawn at least 54,000 every year since 2004. Visit www.HUSKERMAX.com for more.